Shakespeare's Othello, now playing at the Guthrie Theater, is billed as "an astonishing epic of sweeping passions and murderous ambition – a thrilling meditation on the power of love and the destructiveness of suspicion, all triggered by one of literature’s most seductively manipulative villains." It's the kind of Shakespeare play where half of the characters end up dead in the epic final scene, a delicious drama. Unfortunately it also requires a level of focus and concentration that I did not have after too many late nights out at the theater; the three-hour running time was just too much for me. But I was still able to appreciate that it's a beautiful production with marvelous performances by the large cast of Guthrie favorites. 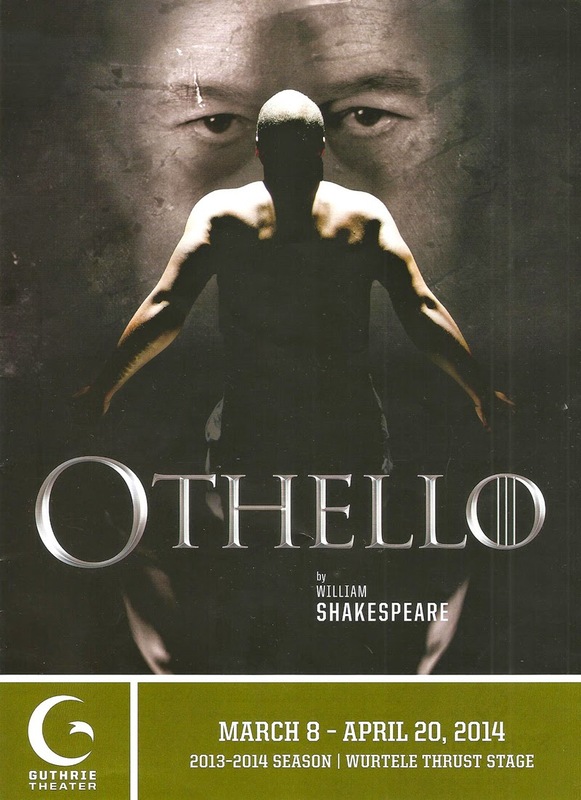 The basic plot of the play is this: Iago hates Othello, his superior in the Venetian army, and plots to bring him down. This plot involves making him think that his new wife Desdemona is having an affair with his lieutenant Cassio. The plot succeeds, in a way, but Iago is not left unscathed. I've recently been watching the Netflix series House of Cards, and couldn't help but be reminded of Kevin Spacey's slimy manipulative politician when watching the lengths Iago goes to and the many people he manipulates to get back at Othello. The costumes by ESOSA (aka Project Runway contestant and Tony-nominated designer Emilio Sosa) are gorgeous, especially Desdemona's parade of dresses that would make Queen Marjaery jealous. Emilia's bold orange gown is also stunning, as are the men's multi-layered costumes. And the wigs are really nice as well. The fight scenes are great fun to watch, and also frightening as they often end in tragedy. Every member of this huge cast of Guthrie favorites does a wonderful job with whatever role they're given, large or small. Stephen Yoakam is deliciously dark and evil as Iago; Peter Macon (who I so clearly remember kneeling with blood streaming from his eyes in Oedipus) has a beautiful commanding voice, and plays the range from giddy in love to devastated and rageful; John Catron is the charming Cassio with another great drunken scene; the three women in the cast - Tracey Maloney as Desdemona, Regina Marie Williams as Iago's wife and Desdemona's lady-in-waiting, and Sun Mee Chomet as the courtesan in love with Cassio - are all wonderful; Kris L. Nelson provides some comic relief as Iago's pawn Roderigo who's in love with Desdemona (fun fact: he's married to her in real life!). 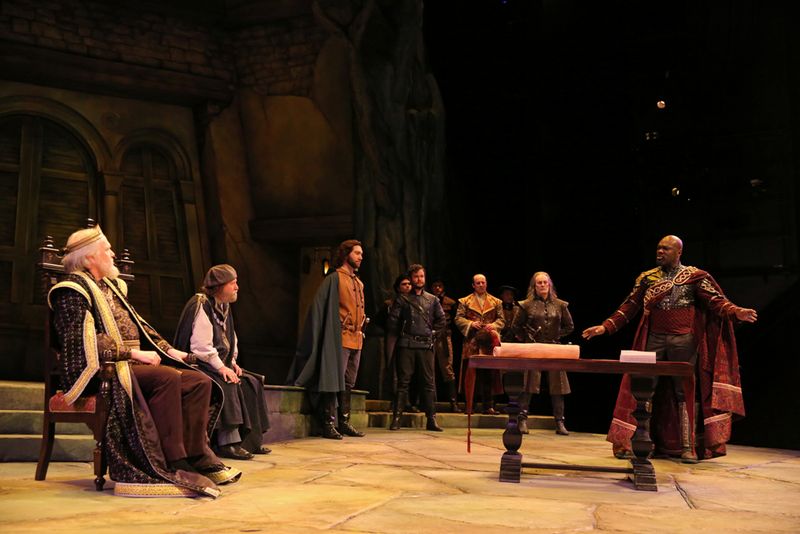 Othello, playing now through April 20, is worth seeing for this wonderful cast directed by the always great Marion McClinton. But if, like me, you are not a Shakespeare expert, I recommend you read a plot summary before you go (you can do that here), and if, like me, you are not a night person, consider seeing a matinee and/or getting a good night's sleep before seeing the show.